As a forex trader, no matter your level of trade experience, you must have come across some sales pages of forex robots that promise to make you a multi-millionaire. Some do not come with such blatant claims, but will still subtly ask you to either buy their expert advisor, or to use it for free as long as you trade with a recommended forex broker. The vendors of these forex robots will even go as far as putting up trade results that appear to look genuine. This is all done in an attempt to make you purchase their robots. The key question that must be answered is this: if all the claims, statements and trade results were as true as the sales pages make them out to be, why are there still numerous complaints of products and software that cost so much and yet do not work? Surely there must be a disconnect somewhere, and that is exactly what this article is going to show. You will also learn to analyze a forex robot’s performances before you cough out your hard earned money to pay for another one. FX Robots: What is to be Analyzed ? By the time any forex robot under consideration is put through the scrutiny that each of these parameters would ensure, you would have no difficulty in identifying the bad robots on the spot, while also picking some good ones which can do great things for your account. Good a thing most forex robot vendors usually put up trade results dating back several months or years, so surely, there must be some trade history that can be looked at. A good source of information as to the authenticity of trade results is third party trade authentication websites such as Myfxbook.com. These websites contain an API through which trade accounts can be linked to their portals. This allows the capture of all trade information on the synced account, which can then be used to construct graphs loaded with information. Now your business is not to know the process by which an account is synced to Myfxbook, but rather to understand how to interpret the data that is captured there. So let’s use an example to show how this is done. To comply with regulatory requirements, the name of the EA analyzed here will be obscured. Let’s assume you already have the name of an EA being marketed to you. You first open an account on Myfxbook, then type in the name of the EA into the search bar. Click on the search button (the magnifying lens at the right side of the search bar). Select the ‘Systems” tab. This shows the various forex systems and EAs that are associated with the name you just entered. Click on the one that applies to the EA you want to check out. Click on the forex robot to be analyzed. This opens the various charts that showcase data on Profit, Account Growth, Drawdown % and other data. You also see the starting capital and how much money has been made or lost. The trade history is shown on the left. 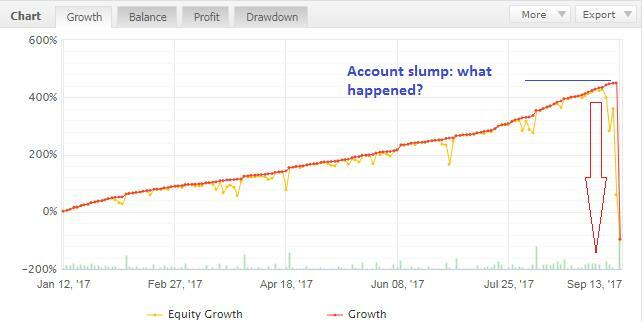 The account has gained 18.13%, with an average daily gain of 0.08% and a monthly gain of 2.79%. The initial deposit on the account was $1000. The account balance now stands at $1181.32. We also see the charts on the right, but these will be discussed further in the next few paragraphs. The drawdown percentage is a very important metric to consider. What is a drawdown ? A drawdown is a decline in the equity on a forex account. So it simply means that the larger the drawdown percentage, the smaller the account capital will become. 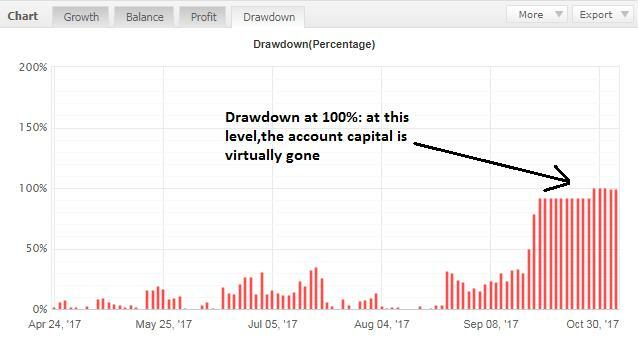 Drawdowns will occur on most forex accounts, but the extent of drawdown is what is important. As we can see from this snapshot, the drawdown percentage showed a gradual decline, which is actually a good thing. Even when the drawdown percentage was high, it never exceeded 30%. Now compare this with the snapshot of another EA below which has a drawdown percentage of nearly 100%. Which EA would you choose over the other? As much as possible, only use results that are verified, and which are operated on a real money account. Using results from a real money account shows exactly how the EA would perform on your own money when it is actually trading. So obviously, you would want a real money account snapshot to know how the EA would perform under true market conditions. Notice how well the EA was performing until it hit a bad slump in September 2017. As at the last check, the site advertising the EA was offline. This shows the importance of checking the latest trade results for the EA under consideration. You are in forex to make money. Therefore, a forex robot that does not make money is not worth your time and attention. It is that simple. So you can check the profitability graph to check how profitable the forex robot has been. This snapshot shows a robot which has gained 74.25%. The profitability chart, which can be visualized by clicking on the “Profit” tab, shows clearly that the profit trend is on the upside. However, also notice that the profit line has started to plateau. So while the robot here shows some considerable profitability history, the trader may need to check out the drop-off in performance. You cannot review a forex robot without the opinions of those who have bought and used the forex robot in question. You will need to do a lot of searching for this information online. Reviews from real, verified traders who have bought the software can be a source of crucial information. Experienced users have been known to pick out plagiarized or repackaged software. Some can also pick out strategies used by the EA, and can sound alarms when risky strategies are deployed. User reviews are invaluable for forex robot analysis before you buy. Now doubt, you are now better informed on how to evaluate a forex robot before you buy. So if you have been receiving a lot of market material for expert advisors, ensure you play your part in the process by scrutinizing the marketing information sent to you.